The engineer goby is one of my absolutely favorite saltwater fish. I’ve kept them in my display tank for years. They are one of the most inexpensive fish in the saltwater aquarium hobby, most of the time with a cost below $10 for a small juvenile fish. As a juvenile fish, the engineer goby looks a lot like juvenile saltwater catfish. The catfish species they look like (and can often be confused with) have venomous spines, so it is thought that the engineer goby mimics this look as a protective adaptation. As adults, the EG completely changes their look. The single, horizontal neon stripe disappears and is replaced by a black and yellow striping pattern. In some individuals, the pattern looks a bit like jailhouse stripes, which has also earned them the additional nickname convict blenny. They grow into this new coloration pattern over the first year of their lives. In addition to having these interesting stripes/bars, adults are long, slender and eel-like in shape. In fact, your non-fishy friends that look at your tank are very likely to think they are, in fact, eels. If you want, you can bore your friends by informing them that they are not eels, they are engineer gobies. Then, once they understand that, you can confuse them further by informing them that they actually are blennies, not gobies. Their Latin name is Pholidichthys leucotaenia. Engineer gobies fascinate me because of their digging behavior. They are a shy species of fish and spend most of their time in tunnels that they dig in your sand bed. What I love about them is that they don’t just build one set of tunnels to build their dream home and retire. On the contrary, they never seem to stop digging. They are constantly digging and re-digging tunnels in your sand. These fish spend nearly all of their time in the sand, digging, so they are best kept in a tank with a live sand substrate or deep sand bed. They also use some small rubble or crushed aragonite for their burrows, but most of the digging happens in the sand. At feeding time, they will dart up and out of their burrow to grab some food. According to Matt Wittenrich, in The Complete Illustrated Breeder’s Guide to Marine Aquarium Fishes, the convict worm blenny is a relatively easy fish to breed in the home aquarium. Since these fish are inexpensive and mostly sold as juveniles, for just a few dollars, the most straightforward way to create a mating pair is to buy 5-7 individual juveniles and let them pair off on their own. Spawns are reported to be relatively irregular, happening just once or twice per year, but are of a relatively large size, averaging 400-500 larvae (again, according to Witt). Even though I’ve kept these fish in my tank for years, I’ve unfortunately never observed spawning, but here’s why I’m so obsessed with the idea. Engineer gobies are the cichlids of the sea. Once the larvae hatch from their eggs, they will leave the burrow, under the careful watch of their parents. Yes, like freshwater cichlids, both parents will watch over, protect and even defend the larvae. I can’t wait to wake up one day to see 500 larvae swimming around my engineer gobies! The convict blenny is carnivorous—it’s a meat eater and should, therefore, be fed with high-quality meaty foods, like Mysis shrimp, Artemia (brine shrimp), live black worms or other meaty seafood. They are shy fish, so they often get spooked by the other fish in the tank or fast motions, so be sure to be slow, quiet and patient while feeding these awesome fish. They will also benefit from being fed twice a day if you can manage it. At feeding time, these fish will dart out of their burrows to grab the tasty morsels of food out of the water column as they float by. 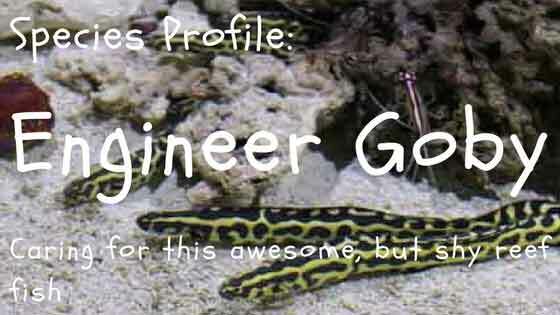 Yes, the engineer goby is reef safe, but you should take a few factors into consideration. As mentioned earlier, they will be constantly digging around under the surface of your sand bed. When they do that, they may actually cause your reef rock pile to sink. If your rocks sink and move, they could even end up causing your structure to collapse a bit. So if you plan to keep this amazing fish in your tank, it is probably best if you can make sure your reef structure starts all the way on the bottom glass. In other words, place the foundation of the reef on the lowest structure you can, not on top of the sand. If you do, the gobies will dig under those rocks and the weight could collapse the tunnel and topple your rock tower. There are also reports of the convict blenny eating fish or shrimp small enough to fit in their mouths. That’s probably true of almost any fish, but watch out for that. It is my observation that this species of fish is relatively prone to be affected by saltwater Ich. More than one individual has had problems with this parasite, seemingly ‘out of the blue’ and while others around them didn’t. Don’t take this observation too far—it’s just a personal anecdote. I encourage you to keep an eye out. I speculate that the fact that they spend ALL OF THEIR TIME in the sand bed puts them always in proximity to the hatching phase of the lifecycle. I don’t know if this is a universal truth about this fish, but I’ve personally observed that the fish is particularly susceptible to death during a power outage. Unfortunately, my engineer goby was the canary in the coal mine, during a power failure, and was the first animal in my tank to have died due to complications from the loss of power. If you have a community tank that is at least ~40 gallons or a dedicated 20-gallon tank for a pair, a deep sand bed and a few dollars in your pocket, you could add this awesome, shy and perpetually busy fish. They are one of my favorites, I hope you will enjoy them too. 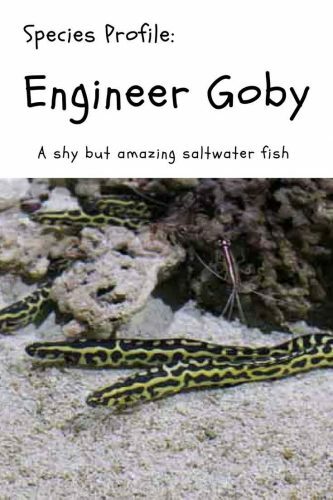 What do you think is an engineer goby in your future? Please leave a comment and let us know if you’re interested in this fish or if you already have one. My engineer goby was also the first fatality during my hurricane induced power outage. I felt especially bad as he was the favorite of his previous owner, and he had quite the personality. 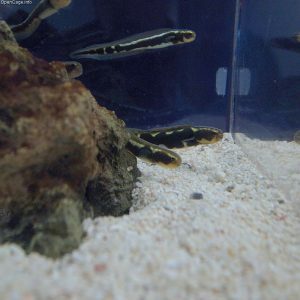 They do look like eels, and that I think is my favorite part, because I don’t know of any reef safe eels. Thanks for the great comment, Jake. They can get large. Great addition. Sorry to hear you suffered the same loss there. The largest fish I can recall seeing were in a touch tank at the aquarium in Camden, NJ (shown in one of the pictures above). They were quite large. I bet over 12 inches at least, and I do hear you about the size being a potential concern for smaller tanks. From what I’ve observed, keeping them for a few years, they don’t swim around all that much. They spend their time digging tunnels and have that space all to themselves. So, I completely agree with you that there is a geometric limitation to the lower limit of the size of a tank, but if compared to other fish that can grow to 12 inches–an engineer ‘goby’ needs digging room, but not much swimming room. In Witt’s book, he suggests breeding a pair in a 20 gallon tank. That’s a bit small for a community tank, but that may help provide a smaller-than-ideal approximate of a good ‘footprint’ of sand for them. Could my Watchman Goby have been killed by an Engineer? It’s now been missing for over a week. Hi Barbara, sorry to hear about your missing fish. Not sure. I’ve never known them to be aggressive.